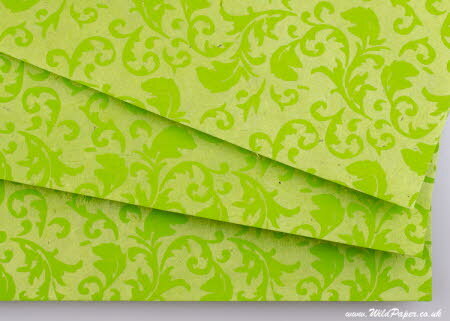 Bright lime green acanthus scrolls on green A4 paper for crafts and artists (pack of 10 sheets). Screen-printed design of lime green leaf scrolls on green lokta paper. This bright lightweight 55 gsm lokta craft paper is thin and flexible and great for a wide variety of crafting projects. It has a smooth calendared top surface and a slightly less smooth reverse surface in green. A4 paper is 297 mm by 210 mm. This is a natural product and the colours are approximate. They vary slightly between batches and may be displayed differently on different computer monitors.